Only 2 Days To Go Until Airborne's New P.A. 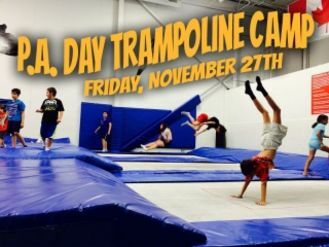 Day Trampoline Camp! Each 9am-5pm day consists of 2 to 4 hours on Airborne’s in-ground Olympic size, high performance trampolines (these trampolines are the same size and type used by athletes in the Summer Olympics Games). Airborne Campers will participate in trampoline lessons and games led by Airborne’s Gymnastics Ontario Certified Trampoline Coaches and Counselors. Campers will jump through Airborne’s Trampoline Skill Level System (22 levels) and earn achievement ribbons and medals for each level passed. Airborne’s Trampoline Camp also includes arts & crafts, indoor and outdoor sports, and a special activity of the day/week. Airborne’s activity of the day/week has the campers enjoying exciting adventures including Dave & Busters, bowling, movies, and visits from Mad Science, Creepy Crawlers and much more (see our activity schedule for more info).